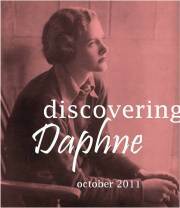 Polly of Novel Insights and Simon of Savidge Reads are hosting the very exciting Discovering Daphne this October to celebrate all things Daphne du Maurier. I first read Rebecca as a teenager and was stunned by du Maurier’s writing style, the sense of trepidation and creepiness which never let up, the almost stream-of-consciousness storytelling and the brooding atmosphere. How I longed to visit Manderlay too! I went on to read Jamaica Inn, Frenchman’s Creek, My Cousin Rachel and several more novels, each different in style and content, including her memoir Myself When Young: The Shaping of a Writer. I’m still rather surprised at how many books she’s produced and that some of her short stories, such as The Birds, was filmed by Hitchcock! She’s one of my favourite writers and I can’t believe I haven’t picked up one of her books in recent years. So this is a great re-introduction to a wonderful and rather mysterious writer. I’ll be reading her collection of short stories, Don’t Look Now and Other Stories, this month. I just started Rebecca yesterday! Perhaps I will be able to join in? Love those reads and I will be following the posts on the blogs. This is going to be nice read along! I remember reading a bunch of hers when I was a teenager. My mom had a bunch on her bookshelves. I wish I could join in, but I just don’t think I’ll have time this month. Totally understand. We all have too many books and too little time to read! Thanks so much for joining in Sakura! I also feel very silly I hadn’t spotted Growing Pains was Myself When Young. I now feel a Daphne fraud! I’m very excited about the short stories! I’m having a short story phase! Of course not! I thought you’d discovered a new book until the second part of the title made me think;) I’ll be starting the stories this weekend, so exciting! I got so excited about this plan that I jumped in and read them in September. Loved Don’t Look Now, and of course Rebecca is my favorite du Maurier, but I’m looking forward in participating in everyone’s discussion. Such perfect autumnal reading! Ha ha, that’s so great! I read your post on Don’t Look Now but will get back to it once I’ve finished to compare notes. Yes, chilling stories for chilly nights!